Jürgen Stroop is looking at a paper or a map. 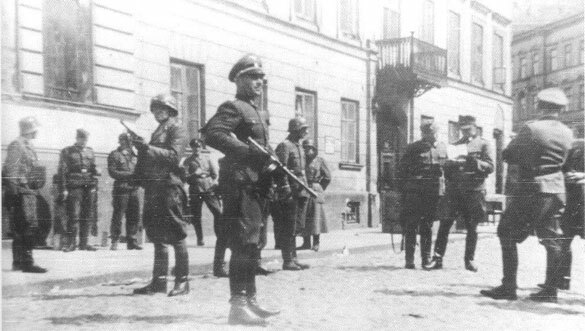 Soldiers around him stand at the ready, indicating that he is in or close to the Jewish Ghetto. Stroop was born at Detmold, North Rhine-Westphalia, on September 26, 1895. He fought as an enlisted man in World War I, winning the Iron Cross 2nd Class. Stroop joined the Nazi Party and SS in the 1930s. In 1941, Stroop fought on the Russian Front with the 3rd SS Totenkopf Division in the Waffen-SS. Jürgen Stroop then became the Inspector of the Security Police in South Russia and then the SS and Police Leader for Lemberg. 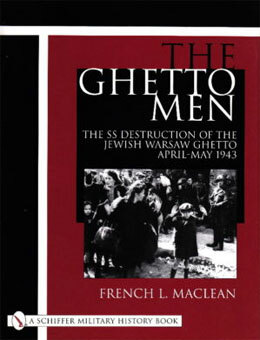 He then assumed duties as the SS and Police Leader for Warsaw in April 1943, received the Iron Cross First Class and was apprehended after the war. Turned over to Poland, Jürgen Stroop was convicted by a Polish court of crimes against humanity and sentenced to death. The Poles hanged Jürgen Stroop on the site of the former Jewish Warsaw Ghetto on March 6, 1952.